Sponsored by IEEE PELS and IAS, the Energy Conversion Congress and Expo 2018 was held in Portland, Oregon on September 23 – 27. And FREEDM was there in force. We had over 20 students attend with five PI’s and our Industry Liaison. Our booth on University Row was nearly overrun with visitors examining some of our projects on display including the Model Design Vienna Rectifier, the Progressively Switched Solid State DC Circuit Breaker, our High Power EV Inverter, a Novel Switched Reluctance Stator. Center members may access the papers presented by clicking the links below this article. As part of the October meeting of the FREEDM Industry Advisory Board, two students presented their research from the ECCE conference. Anup Anurag discussed his work on “Mobile Utility Support Equipment based Solid State Transformer (MUSE SST) for MV Grid Interconnection with Gen 3 10 kV SiC MOSFETs.” The goal of this project is to demonstrate the use of experimental SiC devices in a 100 kW, 3 phase transformer. 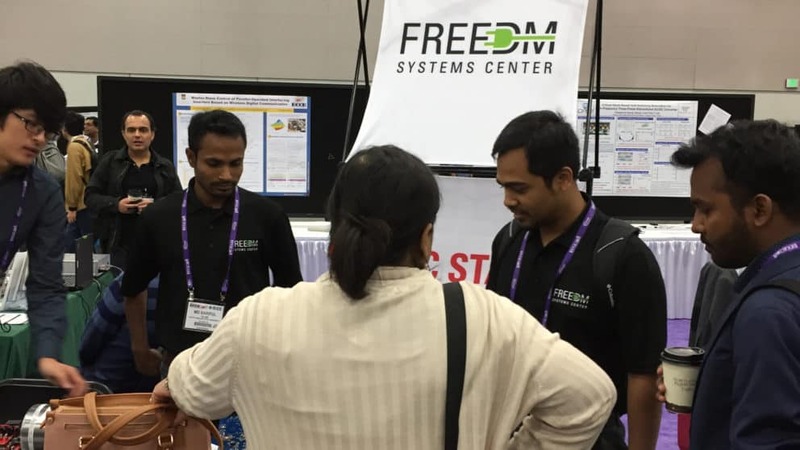 Anup presented the system architecture, showed device characterization test results, explained the issues with the MV gate driver, described the thermal management system, and how the team addressed issues related to high frequency magnetics. Also, Sarif Islam presented his project on a “Method to Minimize Space Harmonics of Fractional Slot Concentrated Windings of AC Machines.” The research objective is to create a winding method that cancels unwanted harmonics and creates a sinusoidal MMF. The proposed solution is a three layer winding such that each slot has three segments aligned to cancel sub and super harmonics. Using finite element analysis, the results show dramatically improved performance with slight reduction in output torque. 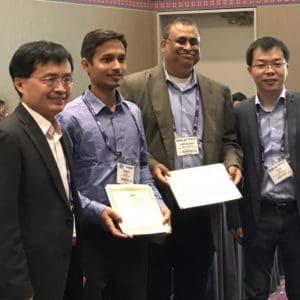 Dr. Hazra and Dr. Bhattacharya receive award for best paper from representatives of Technical Committee 6 at ECCE 2018. FREEDM also brought home several awards from the event. Dr. Subhashish Bhattacharya and Dr. Samir Hazra won the Emerging Technology Best Paper Award for their submission titled “Gate Driver Design Considerations for Silicon Carbide MOSFETs Including Series Connected Devices.” In addition, Dr. Hazra was awarded the Best Thesis Award by the Industrial Applications Society for his research titled “Power Generation and Energy Storage Integration for Wave Energy Conversion System.” A full description of his work and links to related publications can be found here. Members can click here for access to the publications.